This is a one page typewritten letter from Price, Waterhouse & Co. to Leopoldo (Leo) Mascioli and Antonio (Tony) Mascioli. Dated February 24, 1941. 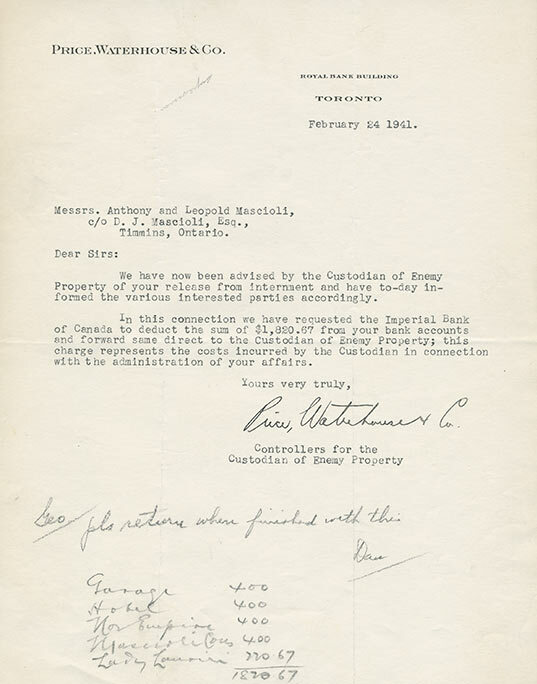 The letter informs the Mascioli brothers that they owe Price, Waterhouse & Co. $1820.67 in administrative fees for Price's handling of the Masciolis' business affairs during their internment. The amount owed will be automatically withdrawn from their bank accounts at the Imperial Bank of Canada. Price Waterhouse & Co. was an agent employed by the Custodian of Enemy Property (CEP), a branch of the Canadian government that oversaw the administration of assets belonging to internees and other enemy aliens. The government office served a dual function. Acting as a trustee for the internee/enemy alien, the office and its agents also protected the interests of the creditors. The CEP would pay off an internee’s debts by selling his or her property or businesses. It also collected money owed to internees by others. Each accounting firm hired by the CEP would bill an internee for administrative costs even though internees did not ask for the CEP to be involved.